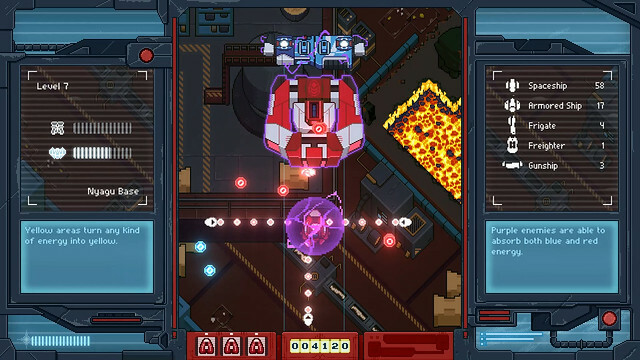 Iro Hero is a top down space shoot ‘em up developed and published by Atrax Games. The game is set 300 years in the future where humans have learned to harness the power of electricity through their bodies, and as a result are hunted and used as energy sources for nearby aliens. The player takes the role of Iro, a young, cybernetically enhanced fighter pilot helping the revolt of the humans against their alien assailants. Story isn’t the prime focus of the game. Every story driven event happens on the sides of the screen while the player must continue to fight against the enemy. This makes it increasingly difficult to keep track of what’s going on and why. Iro Hero borrows a polarity mechanic from the cult classic shoot ‘em up Ikaruga. 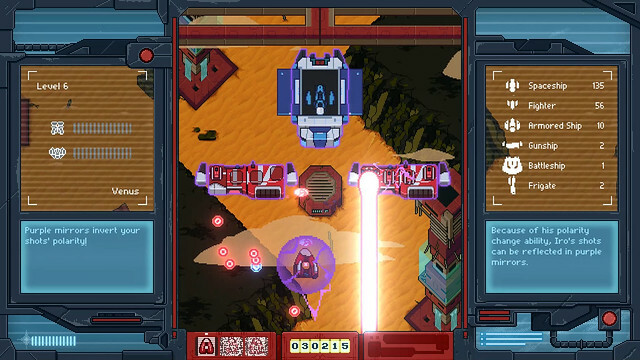 The player’s ship starts as red, enabling them to shoot down blue enemies and absorb any bullets from red ships. 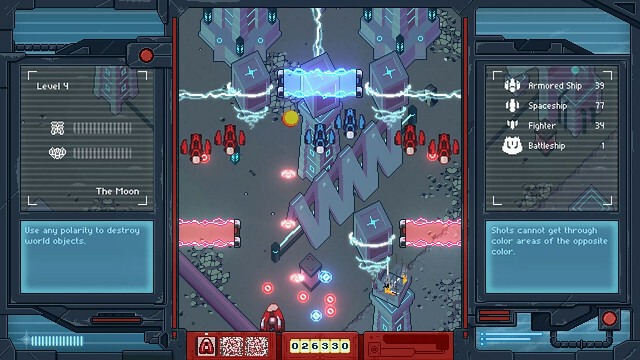 Pressing the “R” button allows the player to shift polarity to attack red ships and absorb blue bullets. Any attacks that are absorbed through this method go towards charging one of two special attacks. The first of which is a homing attack that will indiscriminately attack multiple targets on screen regardless of their color, and another that will unleash a gravitational bomb, instantly destroying everything on screen. 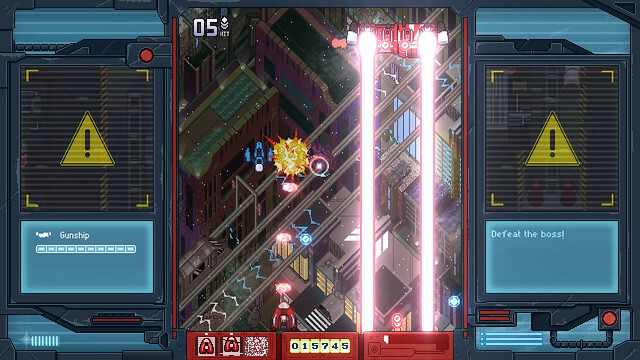 Unlike a few other modern games in this genre, Iro Hero does not contain any other ship types to take control over, opting for the classic arcade feel. The background art for Iro Hero is absolutely beautiful. Every level contains great pixel art of the setting whether it’s set on an energy farm or deep in the reaches of space. The sprites are all color coded to coincide with the polarity system, and the developers go a long way to show aspects of each type of enemy based on their appearance. Smaller ships are faster and can get ahold of you quickly, while white armor is added to the ships that require multiple hits to defeat. While there’s nothing inherently wrong with the soundtrack, and the space centered chiptune soundtrack provides proper atmosphere for the gameplay, there’s nothing incredibly memorable about it either. Each stage has its own music, but it is quickly drowned out by the action happening on screen with no option to turn either sound down, only off and on. The game controls like a classic shooter; relatively simple yet enhanced by the polarity mechanic. The controls make it easy to focus on the enemies instead of worrying about where your ship is going. Most of the fun of Iro Hero comes from increasing your score and getting further up on the leader board. While this is a great callback to classic arcade games, and even featuring an arcade mode giving you only 3 lives to make it as far through the game’s nine levels scoring as high as you can, it lacks any unlockables past the 1cc mode, which only serves to ramp up the difficulty even more. In 1cc mode, the player only has a single credit, meaning no continues, and has no option to buy ships with points at the end of each level. It is the ultimate gauntlet for classic arcade lovers. Iro hero is a fun and tough shoot ‘em up that utilizes an intense polarization mechanic to add puzzle solving to its already hectic gameplay. Unfortunately, it fails to do anything new with the genre, instead just retreading over the same material for a more classic approach.